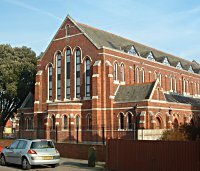 St Andrew's Church was built on the South side of Henderson Road, Eastney, in 1905 and dedicated the following year. 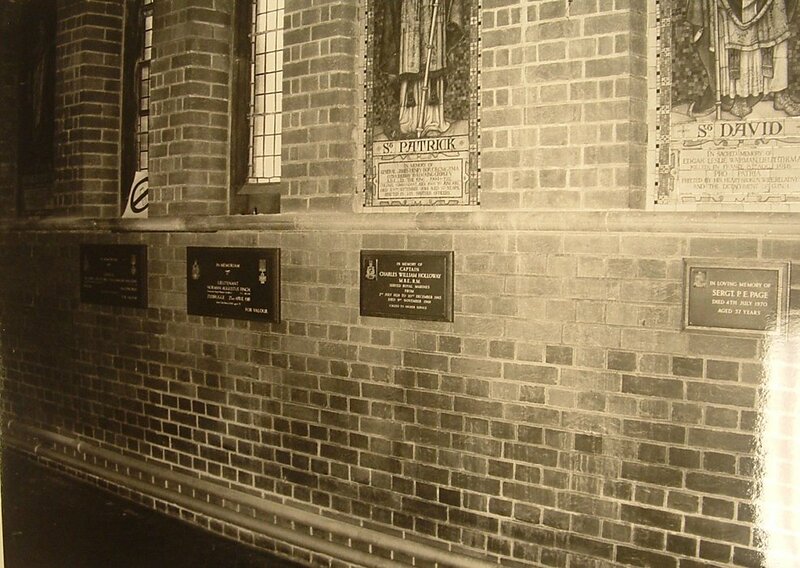 It replaced the previous Royal Marine church, known as the Crinoline Church, which had been built in St. George's Road. St. Andrew's Church closed in 1997 having been sold for development as private housing. There is no public right of access. 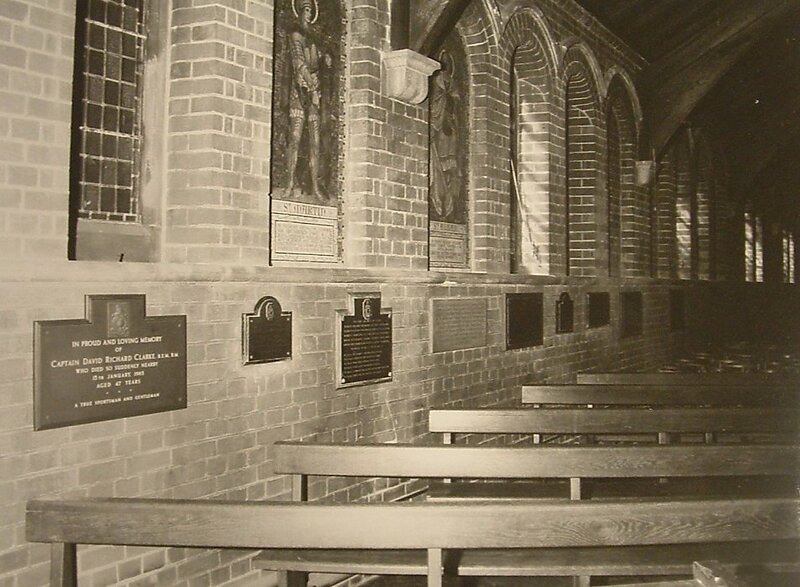 When the church was closed in 1997 archivists from the Royal Marines Museum photographed many of the memorials in situ and then removed those that could be detached from the walls of the church without damaging them. The rest were boarded up in the event of the church one day returning to public ownership. The photographs are currently held at the Royal Marines Museum and are available for viewing on appointment. They are the only evidence currently available of the text on the memorials. Regrettably they are all in monochrome and of low photographic quality and as a consequence much of the text is illegible. Those memorials that can be largely interpreted are listed below. Beneath are some further clues to the as-yet unidentified memorials. Major John Le Cocq Robilliard R.M.A. Hearsay evidence suggests that before the church was closed there were plaques to "The 28 Officers and men of the Royal Marines Artillery who died in the Egyptian Campaign 1882-4", another to Sergeant CE Young & Lt Turner lost from HMS Ramillies - 2nd March 1939 and a window dedicated to an unknown Captain RMA who died: 2nd December 1913. 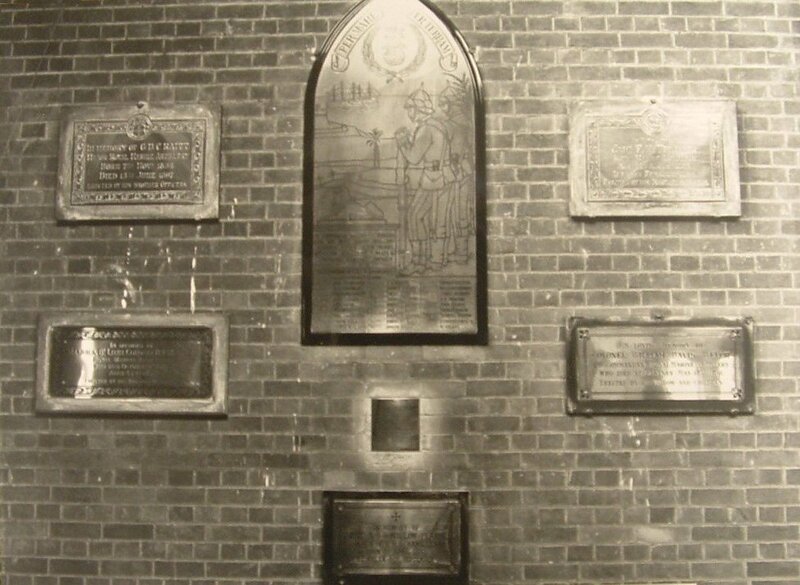 Some of the original church memorials are said to have been removed to the Chapel in Stonehouse Barracks in Plymouth, but this has not yet been confirmed. Brandon Smith reports, in his record of Victoria Cross holders that memorials to Norman Finch VC and Lewis Halliday VC are probably amongst those removed to Plymouth. Both men had streets in Eastney named after them. 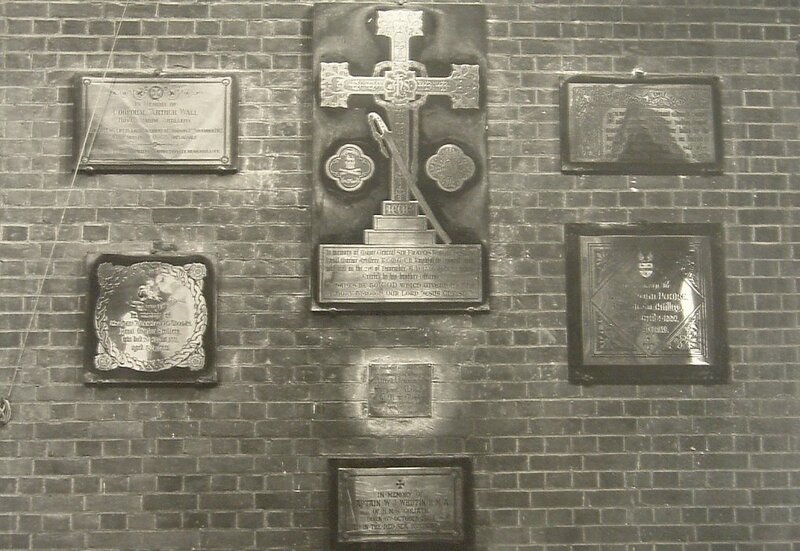 Many of the photographs from the Royal Marines Museum collection were taken at a longer range thereby ensuring that the memorials shown could not be accurately transcribed. Those photographs appear on the left of this page. Any help in identifying them would be most welcome. 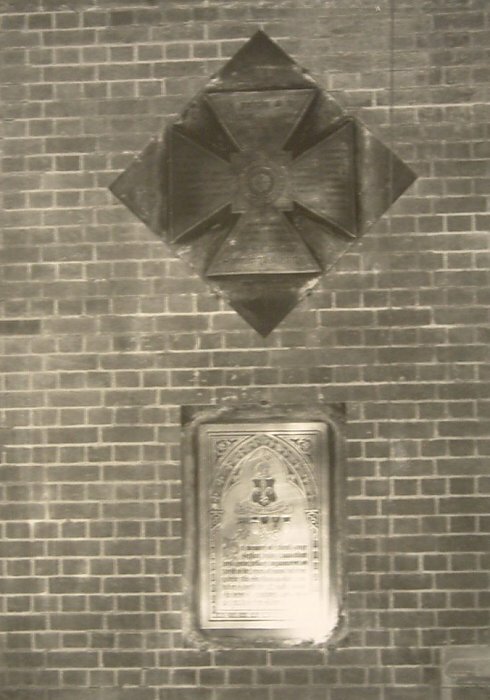 Some partially identifiable memorials are to Captain Charles William Holloway, Sergt. P.E. Page, Lieut. Edgar Leslie Warman and Corporal Arthur Wall. In April 2013 an e-mail was received from John Boyle, son-in-law of Captain David Richard Clarke offering further information about the fate of the memorials. 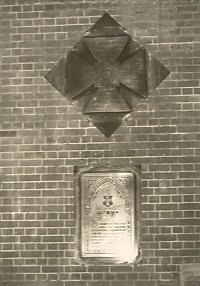 He was able to tell us that the memorial to Captain Clarke had been removed to the top of the stairs to the entrance of St Christopher's Chapel at the Royal Marines Barracks, Durnford Street, Stonehouse, Plymouth PL1 3QS. If this is what happened to one plaque then presumably it was also the fate of others. Captain Clarke's ashed had originally been held at the church but on it's closure they were spread on the Memorial Gardens in front of the RM Museum. John was also able to tell us that "The Royal Marine Museum, as custodian of the Memorial Gardens informed us that the ashes of many deceased Royal Marines had been scattered on the ground surrounding St Andrews Church. On its closure, all the soil was removed twelve inches down and placed in the Memorial Gardens in front of the Museum."